I'd like to introduce the fourth and final kitten in this kindle. 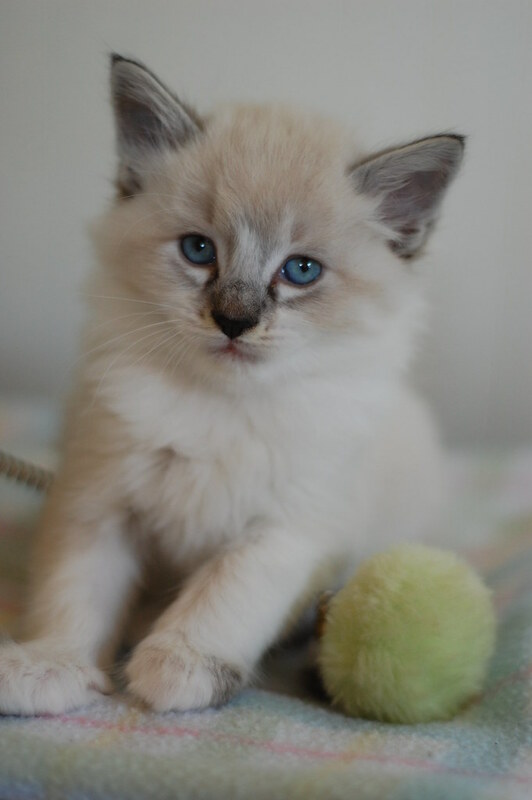 Please say hello to our lovely little lilac point, Mr Arthur Musselman! these kittens are very stubbular.heartbreakers, all! That face! Look at his expressions! 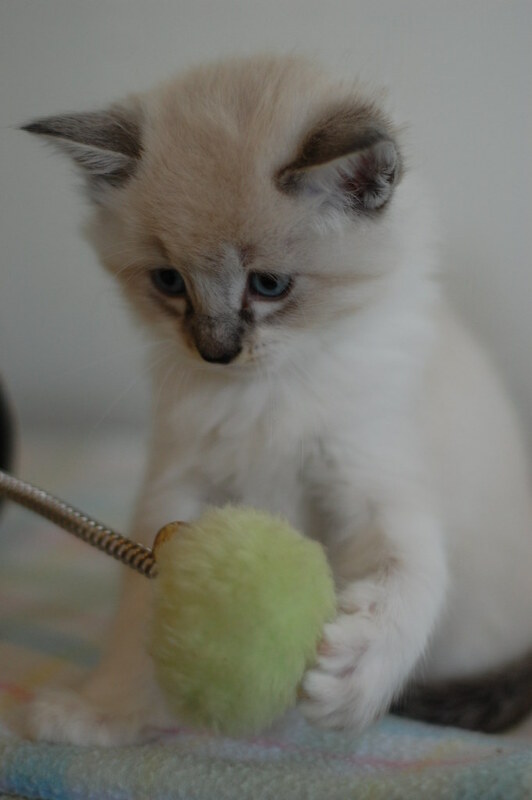 He's going to be a kitty Einstein with personality plus. I can't WAIT until The Bean gets her paws on him. yes! they ALL remind me of Norman. this little guy is adorable. 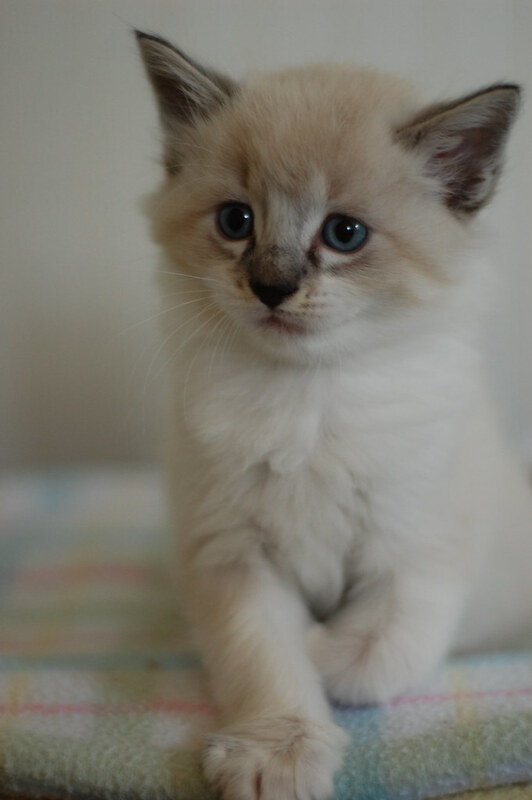 and he is going to be an even more beautiful cat. I would LOVE to sink my hands into his thick polar-bearish coat of hair! If that's not the face of an Arthur I don't know what is. Artie! Big guy! Come on over here and give your Auntie BonzoGal a big smooch. he's a little polar bear with a dirty nose! look at that floooof! and his ears are still on the side of his head... these photos are making me squeal at work, somebody stop me! what do i do with this little green thing on a spring?? OMG!Arthur, Art, Artie! I am in love! I'll say it again....I love fluffy little ones, and he is a cute one! Oh, that face!! That face!!!! Oh dear, he looks like a floofy teddy bear. You kill me with teh cute! Oh. Wow. Now I don't have time to pine after the Fortunatos, here's another blue-eyed beauty to keep me entertained. What a brood of fluffy heartbreakers! Oh, my goodness, I hope we get to see the final results of how those markings will settle on his full-sized face. With all the floof from Charlene and the Musselmans, you're going to need some kind of super-vacuum! Yo Artie!!! How cute is he?!?!?! I can't believe I have to wait 2 whole weeks to see these delicious kids with the Bean! The floof... it slays me... I may not last. Such a mountain lion-looking face, especially in photo two. Yes, I know the coloring's wrong, but he IS a cat. How precious. Oh my goodness, those eyes!! OH! That....that....widdle nosie, I can't help but want to smooching on it -- please, Laurie? Please smooch his little nose for me? He's a wonderful floofy guy! Charlene must be impatient for the waiting period to go by so she can meet these sweethearts - but at least she had Pal Luigi back for a visit! That will help the time to go by! Any pix of that slumber party? The last 5 posts (yes, including the Baby Bean) contain the five most fluffily perfect itty bitty kitties! Laurie, you live a charmed life. "Ohhhhhhhhhhhhh ohohohohoh! Oh my. Oh my GOLLY." Yep. That's what I just said scrolling through the pics. Oh that nose. Beep! Hello, Arthur, you handsome, handsome boy. You can just hear him saying "And this is my floof ball...it's not as floofy as I am, though. But it's a floof ball, on a spring, and it's mine." Oh, Arthur! You look so serious! If I were there, I would turn you over and nuzzle your tummy! Floofication! O dearie me, Arthur, your lilacness slays me. As if the floof wasn't quite enough! 3) Scoop him up, flip him over, and nuzzle his fluffy tummy!!!! you are killing me. KILLING me. There must be a lynx point tom getting AROUND in the Seattle/Tacoma area. HOW do you ever give up those babies?? I could never be a foster mom, I'd have to keep every single one of them. he reminds me of leon ducharme - from pitter pats of baby cats. i fell in love with leon, same with little arthur. I volunteer to be at the bottom of a kitten pile! What time shall I arrive, Laurie??? ?